Rule #1 at Avalon Farms Homegrown is DO NOT PUT TOMATOES in the refrigerator! Can you tell we're serious about this? The reason is that cold begins to breakdown the cell structure of the tomato and the flavor goes with it. Keep tomatoes at 50 degrees or warmer and you'll have tomatoes with flavor and good texture. Rule #2 at Avalon Farms Homegrown. Wash your salad greens! We are not licensed to sell anything ready to eat. 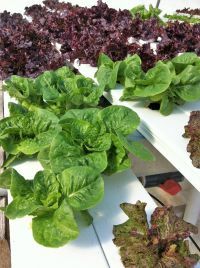 Give those greens a quick wash in cold water then spin them dry in a salad spinner. If you're not going to use them immediately put them in a resealable plastic bag along with a dry paper towel. Our fresh greens will keep this way for a couple of weeks, or more. Get salad greens as dry as possible because water is the enemy. It will shorten the length of time the greens will keep in your refrigerator. Don't own a salad spinner? Buy one. A good one, with either a pull string or a pump...not one you crank. Never one you crank.The ones that have to be cranked just don't provide enough centripetal force to get the greens really dry. It's a good investment. Not only will your salad greens last longer you can use the salad spinner to dry fresh herbs, kale, Swiss chard, radishes, collards, strawberries, blueberries, even elbow macaroni for macaroni salad. Don't use it on raspberries though! Rule #3. Raw potatoes and onions don't go in the refrigerator, except for green onions or onions that have been sliced or chopped. Store those potatoes and whole onions in a cool, dry, dark place. Rule #4. Sweet corn does go in the refrigerator but not for long! The sooner after harvest you eat that sweet corn the better it will taste. Leave the husks on, maybe keep it in a brown paper bag in the refrigerator, for as few days as possible...like one or two. Yes, we're particular about how our sweet corn gets treated. Rule #5. Try new vegetables! If you don't know how to clean it or prepare it, just ask! And remember, not every vegetable needs to be cooked. Take kohlrabi for example. Wash it, peel it if you want but you don't have to, slice it or chop it and eat it! Put it in a salad, add it to a crudites tray. It's fresh and crispy, almost sweet in a vegetable sort of way, and mild flavored. Of course you can cook it, too, check out the recipes page. Rule #6. Wash those melons before you cut them. Bacteria on the exterior of the melon can be carried to the interior when the knife cuts through it if you don't wash the exterior thoroughly. Yuck! Rule #7. Remember, fruits and vegetables are grown out of doors, in fields or gardens, where there is dirt, and bugs, and other critters. Not that you should be frightened by that, it just means that you really ought to wash everything before you eat it. Who knows when a bird last flew over? Double yucky! No, these aren't actually "rules". More like suggestions. But we hope you will find these suggestions helpful. We do everything we can to provide you with high quality, safe fruits and vegetables. Once the produce leaves the farm it's up to you to take care of it to maintain it's quality and making sure it remains safe. Want to know more about preserving fruits and vegetables? Most fruits are very easy to freeze. Take blueberries or cranberries for example. Spread blueberries on a baking sheet, unwashed, and put them in the freezer until firm. Transfer them to a resealable bag and back into the freezer. This way you'll have free flowing good quality berries to use throughout the year when blueberries aren't in season. Cranberries can be keep in the refrigerator for several weeks right in the container you'll bring them home in. If you want to freeze them either chuck the entire container directly into the freezer when you get them home or pour them into a resealable plastic bag and put it in the freezer. Vegetables require a little more work because they need to be 'blanched' before being frozen, but it really isn't hard. Canning fruits and vegetables is a more complex process than freezing. Specific steps must be followed, there's some specific equipment needed (canner or pressure canner depending on what foods are being processed), and jars must processed for the correct amount of time so that the food is safe to eat later on. It's really not hard, many people find canning very satisfying, but you do have to follow some rules to do it right. If you can find a Ball Canning Book latch onto it because it will have almost all the information you need to know in it. If you know someone who is experienced at canning, talk to them, maybe they'd be willing to teach you how. Once you've got the basics down you can do anything!